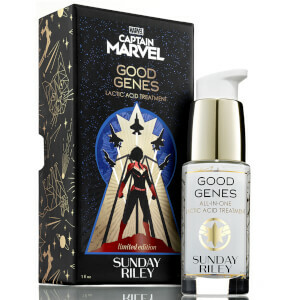 Discover multiple anti-aging benefits in one miracle formula with the Good Genes All-In-One Lactic Acid Treatment from Sunday Riley. The treatment can be used as a moisturizer, a face mask or a brightening serum and works hard to visibly improve skin texture, tone and appearance. Enriched with Lactic Acid to smooth out fine lines and wrinkles, Licorice to balance uneven skin tones, Lemongrass to improve circulation and defend against environmental toxins and a patented NV-5 Complex to combat premature aging, the treatment provides the ultimate answer to younger-looking skin. 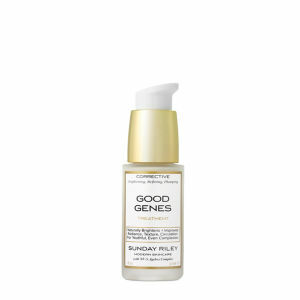 Good Genes aims to reverse the damage caused by UV rays, acne and pollution, improving the appearance of hyperpigmentation and replenishing moisture for skin that looks smoother, brighter and healthier. 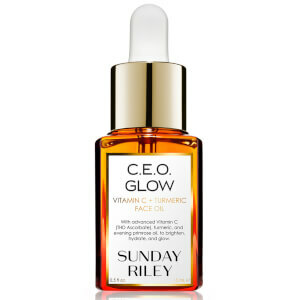 Use five days a week as a serum, either alone or under your chosen Sunday Riley moisturizer. Or apply a thicker layer to cleansed skin and leave for five to ten minutes, to rewind ten years! Agave Tequilana (Blue Agave) Leaf, Cypripedium Pebescens (Orchid), Opuntial Tuna (Prickly Pear) Fruit, Aloe Barbadensis Leaf Extract & Saccaromyces Cerevisiae (Yeast), Glycyrrhiza Glabra Extract, Lactic Acid, Caprylic/Capric Triglyceride (Coconut Oil), Butylene Glycol, Squalene, Cyclomethicone, Dimethicone, PPG-12/SMDI Copolymer, Stearic Acid Glycyrrhiza Glabra (Licorice) extract , PEG-100 Stearate, PEG-75 Meadowsol, Lemongrass Extract, Arnica Extract, Triethanolamine, Xanthan Gum, Phenoxyethanol, Steareth-20, DMDM Hydantoin. This is my second bottle. I have never used a product that actually does what it says. It’s pricey but well worth the price tag. Everything it says it does! My skin looks and feels amazing a few minutes after applying. It’s amazing. If you are in the fence give this a try. I normally don’t leave reviews but I had to with this product. I don’t know what it is but it WORKS! My skin feels soft and looks dewy. Imperfections seems to fade and my skin tone has improved while using this. Plumps my face naturally and gives me a super glow. I love this stuff. Will buy again and again!! Best product I’ve ever purchased. You see results very quickly. Smell, feel, packaging- it’s a twenty! I have overall good skin without serious problems, but sometimes get very small acne-like dots. I used Good Genes for a week and I noticed a huge difference on my face. Now my face is very even, smooth, almost flawless. The only thing I don't like is the smell. Definitely recommend for ladies with lots of breakouts and acne.